The highly anticipated French Voilah! Festival opens with the launch of Luminéoles Ballet at Clifford Square. 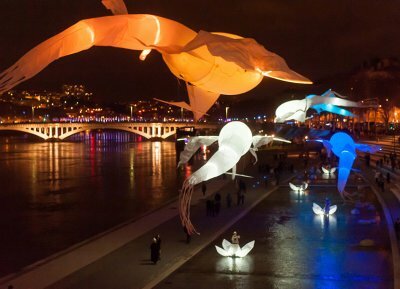 At nightfall, watch giant dragonflies and carps take flight into the air and dazzling flowers blossom in this dream-like performance that harnesses the power of light, air and wind. Follow the Luminéoles as they float and swoop through the air from Clifford Square to Merlion Park, before returning to Clifford Square and continuing their journey on to the Promontory and finally ending their flight at the Art Science Museum.